Burnaby: The South Burnaby assembly had gospel meetings from February 4-March 2 with John Meekin and Jonathan Procopio. Four professed to be saved. Please pray for others who expressed interest and are still attending regular gospel meetings. Vancouver: The 99th Easter Conference was a blessing to the saints. Ministry and gospel meetings were shared by Stephen Grant, Jim Jarvis, Scott MacLeod, Peter Ramsay, and Dale Vitale. Stephen Grant and Scott MacLeod continued in the West Richmond assembly for four nights of Bible readings, taking up the seven kingdom parables in Matthew. Corner Brook / McIvers / Parsons Pond / Rocky Harbour: The saints appreciated the visit of Bruce Rodgers during the month of March. He gave timely ministry on subjects relating to the sovereignty of God. Corner Brook and McIvers also appreciated the visit from Alex and Irene Dryburgh on their way to Gander conference. He ministered on the subject of the Holy Spirit. Gander Bay: The saints were encouraged with two nights of ministry from Bruce Rodgers on March 20-21. He spoke on “The Groanings of the Lord” in John 11. Sandringham: During the last week of February, Marvin Derksen visited the assembly for two nights of ministry and stayed for the Lord’s Day. On March 22-23, Bruce Rogers also gave two nights of ministry. The visits by the Lord’s servants and their ministry was appreciated by the saints. Brampton: Gospel meetings are planned to commence on May 6. The meetings will be taken by David Booth and Jim Jarvis, starting at 6:30pm on the Lord’s Day and 7:30pm Monday to Friday. The series is planned for at least two weeks, with the possibility of continuing if further interest is shown. Please pray for the Lord’s blessing on this effort. Kirkland Lake: Stephen Grant (Scotland) gave helpful ministry at the annual weekend conference in mid-March. The conference, while geared toward teens, involved all ages and provided opportunity for teen social interaction as well as the ministry. Midland: The assembly finished a short series of gospel meetings with Bill Seale and Gary Sharp, in early March. Three contacts from children’s meetings professed faith in the Lord Jesus Christ during the first week and one professed the last night. The preaching by both brethren was simple, plain, and searching. 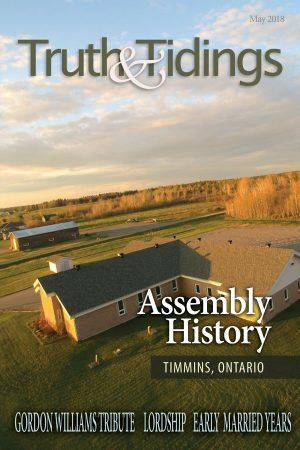 The Waubaushene assembly supported the meetings faithfully, as well as other distant assemblies when possible. Mississauga: The Applewood Heights assembly enjoyed, and was encouraged by recent visits from Clive Barber, Jonathan Black, and Jim Jarvis. Sault Ste. Marie: The assembly enjoyed ministry from Bert Snippe from March 24-25 during the mini-conference. The subject covered was 1 Timothy 1-4. Copies of the ministry are available. East Los Angeles: The annual conference was held in March with help in the Word given by Tom Baker, Marcus Cain, Philip Lampkin (London, ON), Donoso Sermeño (Guatemala), and Salvador Zurita (Santiago, Chile). Turlock: The assembly rented a hotel room for their March 10-11 conference and attendance was higher than ever, with over 50 present. Some from as far as Arizona and Wisconsin attended, with believers from a number of California assemblies also present. The believers were encouraged from the ministry and the gospel that was preached both days. Dunkerton: The assembly held children/youth meetings from March 18-23, with Scott Barrett (Stout) as the featured speaker. Garnavillo: Gospel meetings with Brandon Doll and Larry Perkins closed on March 30 after three weeks. Hampton: Three believers obeyed the Lord in baptism on April 1. One of them was from Guatemala. Stout: Frank Sona and Brody Thibodeau commenced gospel meetings on March 18. Battle Creek: Venezuela Relief Fund Update: In the first three months of this year, most of the assemblies in Venezuela have received food shipments. Please pray for the continued safe delivery of food and other necessary items which are planned to be delivered throughout this year. Jackson: Joseph Baker and David Petterson shared in a series of gospel meetings in the first two weeks of March. The Lord gave help in the preaching, many visitors attended, and the assembly was encouraged. Saginaw: The Saginaw and surrounding assemblies appreciated a visit from Bert Snippe on March 22. Bruce Cottrill and Sidney Turkington purposed to be with the assembly for their bimonthly ministry meeting on April 8. Fridley: Alan Davidson purposed to be with the assembly April 8-11. Blue River: Gospel meetings with Al Christopherson and Larry Steers closed on Wednesday, March 28 after seven weeks with some blessing. Chihuahua: The brother of a believer in the assembly recently passed away after a difficult battle with cancer. Several days before, he found peace and pardon through Jesus Christ. The believers were able to preach the gospel in the home with the family showing good interest. The assembly enjoyed a visit from Shad Kember for a Lord’s Day at the end of March. San Luis Río Colorado: The assembly recently received visits from several brethren who shared in the responsibilities of the meetings. Clive Barber, Allen McCandless (Sussex, NB), and Abisai Vieyra were present on different weekends in March. Hermosillo: The assembly held its annual conference in March with encouraging attendance of believers and visitors from several areas of the country, as well as some from the USA. John Clingen, John Dennison, and Andrew Ussher (Toronto, ON) all shared in the responsibility of the preaching and teaching of the Word. Prior to the conference, the believers rejoiced when three young believers, all with parents in fellowship, were received into the assembly. Guasave: The assembly has been exercised to take the gospel to different areas of the city, preaching on Saturday afternoons in different homes of the believers. Puerto Vallarta: The assembly in El Coapinole enjoyed a visit from Jonathan Seed and his family in March. Jonathan gave appreciated help in the gospel and ministry. Irapuato: Ricky and Erika Sawatsky, and the believers here, enjoyed a visit from Ben Thiessen (Portage la Prairie, MB) and Paul Thiessen. Their ministry was appreciated. Zamora: The Easter conference weekend was a happy time of fellowship. The Bible reading was on the authority and autonomy of the assembly. The saints expressed their thanks for truth being taught in the Bible reading and ministry given on related subjects. Iguala: The tent series that commenced at the beginning of 2018 finished on March 23, with God working in salvation. Three believers were baptized on the last night of the series, bringing additional joy to the assembly. Xalapa: Timothy and Jenna Stevenson had a meeting in their home each Monday in March where Timothy took up the themes of the incarnation, temptation, crucifixion, and resurrection of the Lord Jesus. More than 20 were present at each meeting, mainly neighbors, which was an encouragement to them, given the religiosity of the people in the area. They also visited Tuxpan where the interest in the gospel is increasing. Rathmines: A short gospel series was conducted by Jack Hay in Dublin at the beginning of March. Although three nights of the first week were cancelled due to snow, the assembly was encouraged by the series and by those in attendance. Following the series, the assembly hosted Paul Kissick’s Bible Exhibition for an evening. May 25-27, Spanish Conference in the Nash Road Gospel Hall, 105 Nash Road South. Expected speakers: Dan Harvey, Mark Bachert, and Kory Crawford. Subject of the Bible study: “…y velad en oración” (1Pedro 4:7); (“… and watch unto prayer.” 1Peter 4:7). Accom: Roberto Ortiz, Tel: 905 537-4042; E-mail: robortiz@live.com. May 26-27, in the Centro Evangelico Springdale, 408 E. Meadow, Springdale, AR 72764. June 8-10, with prayer Thursday, June 7 at 7:30pm, followed by three full days of ministry, Bible readings, missionary reports, gospel, and the Breaking of Bread. The opening prayer meeting will be at the Fifth Avenue Gospel Hall, 502 Fifth Avenue. All meetings on the Friday and all meals provided during the weekend are to be at the River Road Gospel Hall, 350 River Road. Meetings on Saturday and Sunday, except for the Breaking of Bread, will be in the William Glesby Centre, 11 2nd Street NE. The two Bible readings arranged for Friday are to consider Hebrews 1 & 2. General inquiries: Philip Ronald, Tel: 204 870-1140; E-mail: pronald@mymts.net. Accom: Malcolm Stanley, Tel: 204 857-9074; E-mail: mj@thestanleyshouse.com. The conference is sponsored jointly by the assemblies meeting at River Road Gospel Hall and Fifth Avenue Gospel Hall. June 2-3, in the North Street Gospel Hall, 6417 North Street. Topic: “Christian Joy – A Study of Paul’s Letter to the Philippians.” It will be a combination of Bible readings & ministry messages led by A. J. Higgins, David Petterson, John Meekin, and Matthew Cain. The first meeting is at 9:45am Saturday. For accommodations or more information, contact Andrew Swan, E-mail: andrewswan1@gmail.com; 902 476-0935). June 9-10, with prayer meeting on Friday, June 8 at 7pm. Saturday: Ministry 10am, Gospel 6pm. Sunday: Breaking of Bread 10am, Gospel 4:50pm. Speakers: David Gilliland, Gaius Goff, and Peter Ramsay. Contact: John Kregel, Tel: 563 880-0520; E-mail: j_kregel@yahoo.com. June 23-24, with prayer meeting on Friday, June 22 at 7:30pm. Saturday Bible reading 9-10am, Genesis 24 “A Bride for Isaac.” Sunday “A Bride for Christ.” All meetings in the Gospel Hall, 421 Old Belgrade Road. Expected speakers Peter Ramsey, Dr. A. J. Higgins, David Hunt, and Bryan Joyce. Contact: Jim Thompson 207 512-2636. E-mail: jptbooks@gmail.com. June 22-24, with prayer meeting on Thursday, June 21 at 7:30pm in the Taylorside Gospel Hall (located 3 miles south and 4 miles west of Beatty, SK). Meetings begin on Friday at 2pm. Corr: John Parker, Tel: 306 752-4079; E-mail: jeparker@sasktel.net. June 30-July 1, in the Englehart High School. Friday: Prayer 7pm in the Englehart Gospel Hall. All other meetings in the Englehart High School. Contacts: Jeff Taylor (Earlton), Tel: 705 563-8131; E-mail: jdtaylor1996@live.ca, Doug Yade (Kirkland Lake), Tel: 705 567-5951; E-mail: doug_yade@hotmail.com. June 29-July 1, with prayer meeting, June 29, at 7pm. Saturday: Ministry 9am, Bible Reading (Hebrews 11:1-12:3) 2pm, Ministry 4:15pm, Gospel 7pm, Youth: 8:30pm. Sunday: Breaking of Bread 9:30am; Open Sunday school 11:15am; Ministry 2pm; Gospel 7pm, Youth: 8:30pm. All meetings in Westsyde Gospel Hall, 849 Wawn Road. Meals served June 30 and July 1. Accom: John Eggers, 3664 Westsyde Rd. Kamloops, BC V2B 7H6; Tel: 250 579-8814; E-mail: jfeggers@telus.net. Outline and schedule available at: http://www.westsydegospelhall.com. Note: The assembly has decided to move their upcoming fall conference earlier to September 8-9 to allow more invited speakers to attend. Merlin Russell, correspondent of the Pugwash Junction Gospel Hall, NS, Tel: 902 694-8431 (new number). Manchester, IA Gospel Hall: Luke Roling, Tel: 563 608-2920; E-mail: lukeroling82@gmail.com. Battle Creek, MI: Breaking of Bread on the Lord’s Day is now at 9:30 am. Mrs. Gordon (Doreen) Williams, Hilltop Manor, 4757 – 221 Street, Langley, BC, V2Z 1M7, Tel: 780 402-4671. Marjorie June Holtzhauer of Valens, ON on January 25, 2018, age 100. Marjorie was saved on her 16th birthday, received into fellowship soon afterward, and lived to prove her salvation. She raised her five daughters, all who know the Lord, and was a wonderful neighbor and Sunday school teacher. She and her husband, John Knox, hosted tent meetings on their front lawn for 20 years. She is remembered for her kindness, hospitality, love of family, and the Lord’s people. Her investment in people’s lives was evident at her funeral by the number of neighbors, former Sunday school students, and believers from surrounding assemblies who attended. She wrote weekly to her two daughters in Zambia, and was a great influence on her grandchildren and great-grandchildren. Her funeral was taken by family members Ted Lapsley, an elder and nephew, and sons-in-law David Regis and Rod Badgley. Margaret T. Smith, of Jackson, MI on February 28, 2018, age 87. She was born July 26, 1930 in northern Ontario to Joseph and Janet Provan, and was born again in 1940 while attending Sunday school in Niagara Falls, ON. Margaret was in fellowship for over 70 years and was married to our beloved brother and servant of the Lord, James N. Smith for 62 years, until his home-call on August 4, 2015. She was a tremendous helpmeet to her husband throughout his years of service. She loved God’s assembly, His people, and the gospel. Margaret will be greatly missed by all who knew and loved her. She is survived by three sons, Ken, Doug, and Paul (along with their wives), and two daughters, Lois and Janet (Doug) Losey. Please pray for unsaved grandchildren and great-grandchildren. The gospel was faithfully preached at the funeral by Joseph Baker of Jackson. Lorraine Christopherson of Aplington, IA on March 6, 2018, age 97. Lorraine was saved in 1975 at the age of 54 when Harold Paisley had tent meetings in Allison, IA. She was thrilled to join her husband Floyd (saved in 1972 at age 50 and predeceased her in 2001) in the fellowship at Hitesville. Lorraine and Floyd were given to hospitality, receiving much joy at entertaining believers. She continued faithfully until physical weakness in later years prevented her from attending meetings. Even through the 18 months of nursing home care, she maintained a bright, smiling testimony. Lorraine is survived by two sons, Allan (Gloria) and Tommy (Barb), and one daughter, Elaine (Fred) Nordman, all of whom are in happy assembly fellowship. All six grandchildren know her Savior, as does one surviving sister, Ann (Roy) Weber. The sons and son-in-law, along with Robert Orr, shared in the funeral service. Louis Smith of Jackson, MI on March 2, 2018, age 84. He was saved on March 15,1945 through 1 John 5:13. Louis was baptized and received into fellowship in Jackson the following year. He was an elder in the assembly who was known for visiting smaller assemblies in the area, and for his tireless gospel exercise in handing out tracts. In 1992, Louis became exercised about the work in Russia, and over the next 20 years, he spent two or three months at a time distributing Bibles overseas. When assemblies were later formed in Russia and the Ukraine, he visited them, seeking to teach, and encourage these gatherings. He was predeceased by his wife Pat. His family and the assembly miss him. The gospel was faithfully spoken at his funeral, which was shared by Jesse Fitch and Larry Perkins. Max McLean spoke comforting words about heaven at the grave side. Robert R. Rexon of Barrington, NJ on March 5, 2018, age 87. He was born on December 4, 1930, the youngest in a family of eight. Robert was saved as a young man and after many years of being linked with a large evangelical denomination, he and his wife, Josephine, became convinced of the Scriptural pattern for gathering and came into fellowship in the assembly in Barrington, NJ. He never looked back and for over 40 years he maintained a faithful testimony. Robert was known for his joy in his salvation, kindness, and consistency. He served for many years in the leadership of the assembly. He leaves his wife, Josephine, and two children, Robert Jr. and Joanne Kessler (Bob), as well as three grandchildren, and two great-grandchildren. The funeral service was shared by Paul Barnhardt and E. R. Higgins. Elizabeth Josephine Fadden of Lynden, WA (formerly of Sumas, WA) on March 13, 2018, age 96. Josephine was saved in Everson, WA at age 17, and was in fellowship with the saints at the Parkview Gospel Hall in Abbotsford, BC for over 75 years. Since 2012, she continued to fellowship at the Lynden Gospel Hall, Lynden WA till the Lord called her home. Josephine will be sorely missed as she endeared herself to so many. Her home was always open, tirelessly entertaining saints and strangers alike as she exemplified the love of Christ in her life. She was predeceased by her husband Bruce in 2000, and is survived by seven children and spouses, 14 grandchildren, and 17 great-grandchildren. Elizabeth (Lily) Rannelli of Livingston, NJ on Easter Sunday, April 1, 2018, age 88. She was born on August 22, 1929, and trusted Christ on May 27, 1941. Lily was in fellowship in the Orange/East Orange assemblies and later in Livingston where the assembly relocated. Throughout her Christian life, she was a faithful believer who did all she could to support the meetings of the assembly and further the work of the gospel. Numerous comments made at her funeral indicated the high regard and deep affection in which she was held by so many. She is survived by two sisters, Rose Smith and Ruth Brescia, and numerous nieces and nephews. The verse the family put on one of the printed programs expressed what the Livingston assembly feels as a result of her home-call: “You will be missed, because your seat will be empty” (1Sam 20:18).